Happy Friday everyone! I’m so looking forward to this weekend because Sunday is the twenty-eighth birthday of the most handsome man on the earth! 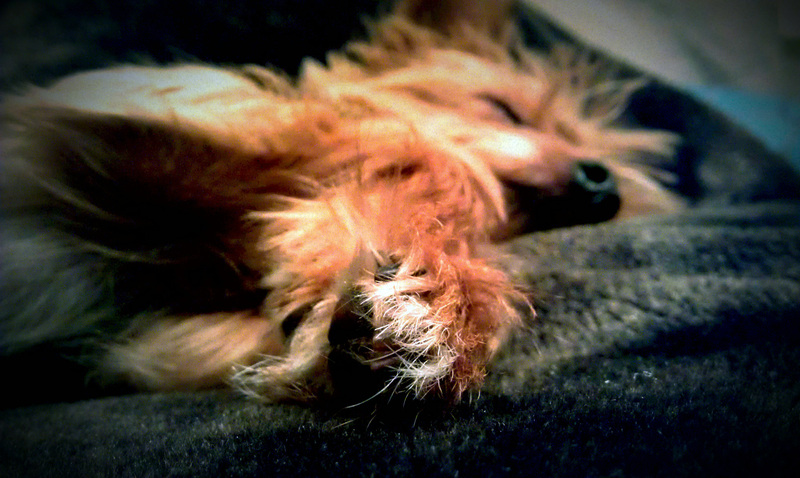 Tia even cherishes her pretty paws! True story: When Matt and I got her we couldn’t decide on what to name her. She ended up being nameless for three days. We kept going back and forth suggesting different names…each of which the other one absolutely did not like. Matt, for instance, wanted to name her Slugger. Um, she’s a girl…we weren’t about to name her Slugger. I’m pretty sure he came up with a few other ridiculous names. I, on the other hand, kept coming up with adorable names. One of the names I had come up with was Frenchie. I thought of the name because all four of her little paws had white fur on the tips…like a french manicure! The husband didn’t go for it. We came up with her name on the fourth day of having her while the husband was brewing some sweet tea in the kitchen. He looked at the jug of tea and said, “Why don’t we name her Tea? Tea…a. Tia!” Oddly enough I loved it and it stuck! So there you go…an affirmation and a cute story to start your weekend! Have a good one! P.S. I’d love to have you be a part of my Friday Affirmation series with your own affirmation, so if you are interested e-mail me at a.habermehl@yahoo.com! Thanks! Love affirmations! And this one is great:-) Thanks! I love this idea, your affirmation is really beautiful!